That’s it! Summer. Gone. It’s bittersweet, because while it’s sad to see the lazy days fade away, fall can be such an inspiring season. Even if the weather continues to be summer-like, post Labour Day it’s back to business for most of us, whether it be school or new work projects. It’s the time of year when you feel pumped to start something new or learn a new skill. Speaking of education, I’d like to remind all you design and lifestyle bloggers out there about BlogPodium on Sept. 21 here in Toronto. It’s a fantastic conference, and this year it’s an all-day affair. Yours truly will be speaking at one of the sessions, and there are plenty of other fabulous presenters lined up, including Sarah Richardson. As a treat for all my readers, I’m able to extend a 10% discount off registration. Purchase tickets here and enter the code blogpodium10. Hope to see you there! + Give the Gift of a DIY Kit. For the crafters and makers in your life: a gift to get their creative juices flowing. 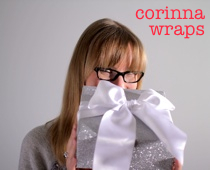 + Pinterest Picks: How to Wrap Cash, DIY Wrapping Paper + More. This renamed column is full of inspiring ideas this time around. + Cheese + Crackers = A Delicious Host Gift. Looking for an alternative to a bottle of wine? Package it right and this yummy combo makes an appreciated host gift.